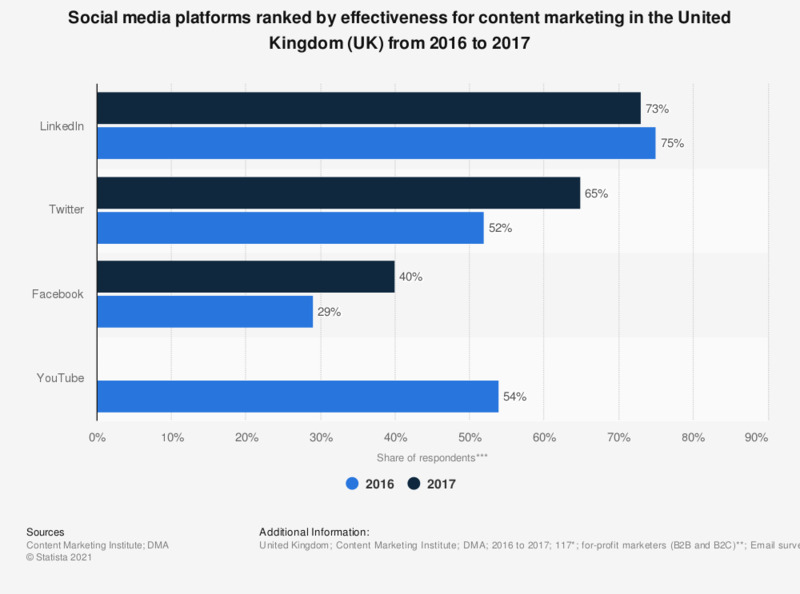 This statistic ranks social media platforms by effectiveness for content marketing, according to marketers who used these platforms in the United Kingdom (UK) from 2016 to 2017. Of marketers, 65 percent ranked Twitter effective for content marketing in 2017. * n (July to August 2016) = 87; n (June to July 2017) = 117. ** In 2017, marketers were contacted using lists from Content Marketing Institute, MarketingProfs, The Association for Data-driven Marketing & Advertising (ADMA), and WTWH Media. *** Percentage of respondents who rated these tactics as a 4 or 5 in terms of effectiveness (on a scale of 1 to 5, with 5 being “Very Effective”).